The problem facing the Armenian community started in July 2008 when the 52-year-old serving Patriarch Mesrob Mutafyan was officially diagnosed with an incurable illness. By then he had been in a vegetative state for some time at the Surp Pirgiç Hospital and remains so ever since. In 2010, Archbishop Aram Ateshian was appointed Patriarchal Vicar with the consent of the Turkish government. This temporary arrangement until the election of a new patriarch turned into an indefinite status quo. The continued uncertainty without a clear sight of elections caused controversies and division within the community. In February of this year, the tensions and internal disagreements, both among the clergy and the laity, reached to a boiling point. Bishop Sahak Mashalian, the chairman of the Patriarchate’s Religious Council, resigned by publishing a fiery letter. He blamed Archbishop Ateshian and certain lay leaders of the Armenian community for the deepening stagnation of the Patriarchate and the community in general. Within days after their return from Etchmiadzin, on March 15, Archbishop Karekin Bekdjian — the most senior bishop of the Patriarchate and the serving Primate of the Armenian Church in Germany — was elected Locum Tenens (deghabah) by 2/3 votes of the Religious Council. According to the agreement reached in Etchmidazin and in accordance to the rules and traditions of the Armenian Church, Archbishop Ateshian was to step down as Patriarchal Vicar immediately after Bekdjian’s election. Many in the community, including two Armenian members of the Turkish parliament, consider the Istanbul Governor’s Office letter crude meddling and lacking any legal and procedural basis. 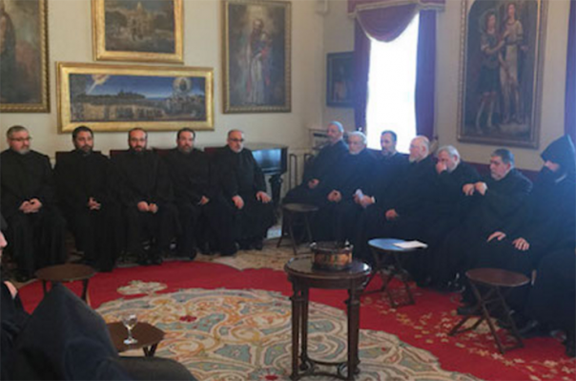 Archbishop Ateshian and his small circle of supporters insist that without the government’s consent no election is valid. This has created a stalemate and tensions are high on all sides. On April 28, 1998, the Istanbul Governor’s Office ordered a halt to the plans without explanations until further notice. Nevertheless, the community went ahead with the election of a Locum Tenens (deghabah). Similar to the scenario played out on March 15, Archbiship Mesrob Mutafyan in August 1998 was duly elected Locum Tenens, but the government refused to recognize him, arguing that under Turkish law the eldest and most senior cleric — Archbishop Sivajian at the time — must fill the interim post until a successor is elected. After months of state interference and delays, the Governor of Istanbul — having received the mandatory approval of the Council of Ministers — permitted the 60,000-strong Armenian community in Turkey to proceed with the election on October 14, 1997. It is not a secret that the government maintains strict restrictions on the Armenian Church’s activities, as it does on all Christian churches in Turkey. After the coup in 1960, the government dismantled the Armenian Community Central Council, the highest lay body in Turkey, which worked for the interests of the community alongside the Patriarchate. In December 1997, the government ordered the Patriarchate to disband its council of lay advisors and forbade lay delegates from participating in the election for a new Catholicos in Etchmiadzin in 1995. The list of restrictions is long and far reaching. In 1971, the state ordered the closure of the Holy Cross Armenian Seminary, which deprived the Patriarchate of training future priests and church workers. Dr. Hratch Tchilingirian is an associate of the Faculty of Oriental Studies at the University of Oxford.